New York Times, USA TODAY, and Publishers Weekly bestseller Karen Robards gave us the (somewhat embarrassing) scoop on her first foray into writing. Her latest heart-pounding romantic suspense novel, HUNTED, is out now! In honor of the publication of HUNTED this month, I want to tell you about how I got started. I became a writer the same way most of us do – by accident. I was twenty- one years old with dreams of becoming a lawyer when I found myself in a graduate- level creative writing class at the University of Kentucky. It was a small class, maybe twelve students, and our professor was a published author. On the first day, we were given a big assignment that was due at the end of the semester: write fifty pages of something publishable. I had no idea what to do with that – what WAS publishable, anyway? So I went to the bookstore and looked around. What was on the shelves were row upon row of historical romance novels, because historicals were hot then the way vampires were a few years ago. I had never read a historical romance, but I bought a few and took them home. They were great! I fell in love with the genre instantly, and then I had the writer’s classic thought: I can do that. So I did. Or at least I tried to. Over the course of that semester, I wrote fifty pages of a swashbuckling pirate story I called THE PIRATE ‘S WOMAN, figuring out things like how long a chapter should be and how to end and begin one by looking at published historical romances. Finally, toward the end of the semester, just as I got my fifty pages finished up, our professor made what was for me a bombshell announcement: he was going to have us read our fifty pages aloud. To the whole class. I almost died at the thought. If it hadn’t been finished, I would have scrapped what I had written and started over. But I was out of time. There was no help for it: when my day came I had to stand up in front of my classmates, all of whom seemed to have concentrated on literary fiction rich in symbolism, etc., and read the first few chapters of THE PIRATE’S WOMAN. After that, I was demoralized, to say the least. But two years later I pulled that fifty pages out of the trunk where I had hidden it in mortification, sent it off to several New York publishing houses, and crossed my fingers. A couple of weeks later, one of them contacted me, said they loved the partial, and asked to see the rest of the book. A year later, THE PIRATE’S WOMAN, officially retitled ISLAND FLAME, was published. It’s still in print today. 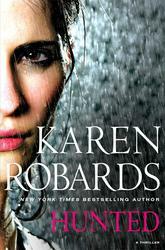 In New York Times bestselling author Karen Robards’ latest heart-pounding romantic suspense novel, a reckless former detective knows too much, and a hostage negotiator is forced to join him on the run for his life. Anyone who has a start like that is bound to be great. Makes me want to go right out and buy ISLAND FLAME. I haven’t read any of your books yet, but you are on my list of authors to read. Just read Karen’s The Last Witness and The Last Kiss Goodbye featuring Dr. Charlotte Stone and her ghost lover Michael…could not put them down. Waiting for the next in the series.